Successfully Added DVR and Image Capture Clip On Surveillance Device (4GB) to your Shopping Cart. 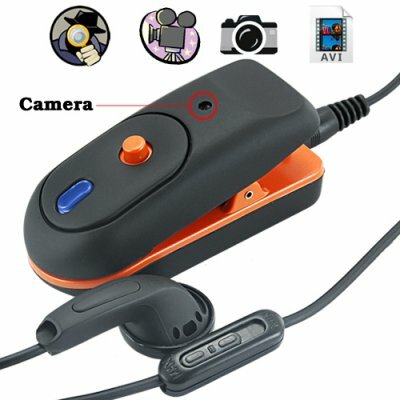 Cool looking bluetooth style clip-on device with secretly built in camera for video and image capture. With a simple click of the multi-function button, simply record video or take photos. Openly capture video and take photos without anyone being the wiser. This fashionable clip-on recorder looks like an ordinary bluetooth device. It is a very convenient clip-on device that has an embedded camera lens for surveillance and ing. Durably built with cool Black and dark Orange color, the CVKA-G146 comes in small sized light weight body design made of hard molded plastic. This fashionable style bluetooth device provides you with a whole new surveillance technique. Just visualize for a moment, its a bluetooth device for your cellphone, you clip it on and go about your normal day. When you see something interesting or suddenly find your self in a situation that you simply must capture on film, without anyone around you knowing, then this secret video and image capture device disguised as a bluetooth device will enable you to become the secrete agent of the decade. Whatever the occasion may be, filming is not always permitted in most areas, and when people know they are being filmed, they control their actions and are careful of what they talk about. The CVKA-G146 is perfect for law enforcement professionals or private investigators. With its internal lithium-ion battery and native AVI recording format, you can easily connect the device to your PC via the included USB cable to upload and view your footage in seconds. The CVKA-G146 is a great surveillance image and video capture for both professionals or people who simple wish to play secret agent. Proudly brought to you by leader in and surveillance electronic gadgets, Chinavasion. No one will even realize they are being filmed, impossible! How much video can I record per single battery charge? You can record up to 1 hour of video footage per full battery charge. Depending on usage, it is best to fully charge and then fully drain the CVKA-G146 internal battery for better battery life performance. Very cool product. The video quality is not all that great as compared to some of the other spy camera products being sold.